Frankie Knuckles is a DJ, producer and remix artist from New York. He has earned the appellation "The Godfather of House." He was the Dj from 1977 to 1982 at the Warehouse. It is widely accepted that his style of DJing and his selection and the appeal of the Warehouse gave house music its name. 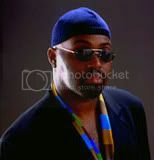 Frankie Knuckles is arguably the pioneering DJ of his generation and is certainy one of house music's founding fathers.